When your car breaks down or you’ve been in an accident, our professionals show up promptly and never tack hidden fees onto your bill. Bob’s Towing & Recovery offers a 24/7 emergency roadside assistance program and are equipped to tow and haul your cars, trucks, RVs, motorcycles, limousines – even your commercial trailers. We are a family owned and operated business that has been in operation since 1981. 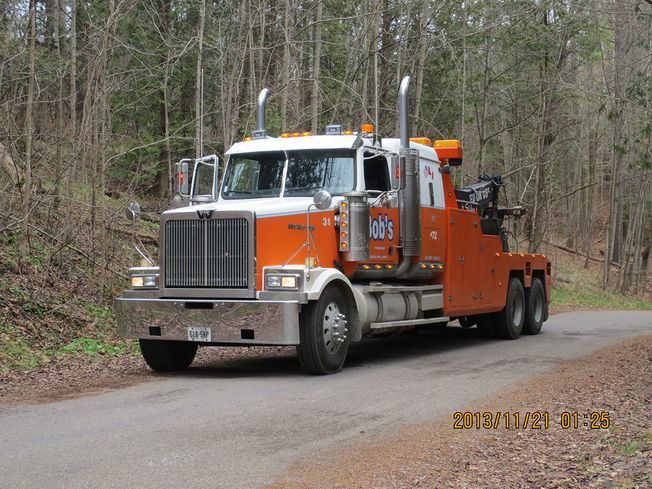 Serving the Guelph area including Wellington County, as well as other communities across Ontario, we can provide the towing services that you need. You can give us a call day or night. You can also reach us for questions by sending an email or by filling out the form provided on this page. With any electronic communication, we will respond as quickly as possible. We provide our services to all of Guelph, and we can tow anywhere within Ontario.